Keynamics Aviator Laptop Stand is stand for laptop for business travelers that designed specifically to fit in the briefcases and fit perfectly on airplane tray tables, with function to raises the laptop screen and tilt the keyboard down so laptop’s user can lean back into the chair, relax the wrists and type in a more ergonomically-correct position. 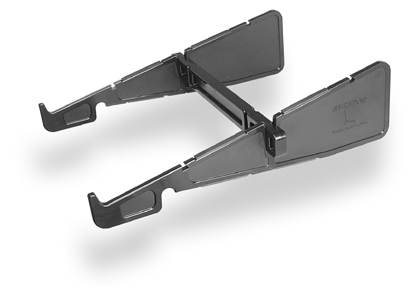 The Aviator weighs nine ounces, is portable where the stand can dissemble into 3 pieces and slides easily into side pocket of laptop case, is easy to assemble, and is designed to stay sturdy even during turbulence or when the somebody next to you accidentally bumps the laptop. NotebookReview uses the Keynamics Aviator Laptop on long-haul business class flight from Los Angeles, USA to Melbourne, Australia with Sager 9750 and concludes that “there was no alarming flex in the tray and I tried to do a side flex and motion test and the whole unit was rock solid. No movement. The little rubber feet on the risers helped keep solid contact with the 9750 and the tray surface.